This is another Classic Reflection by guest writer, Sybil Vasche, as she takes a look at something from across the pond, a British police show from the 2006 series (with a sci fi/fantasy twist) called Life on Mars. 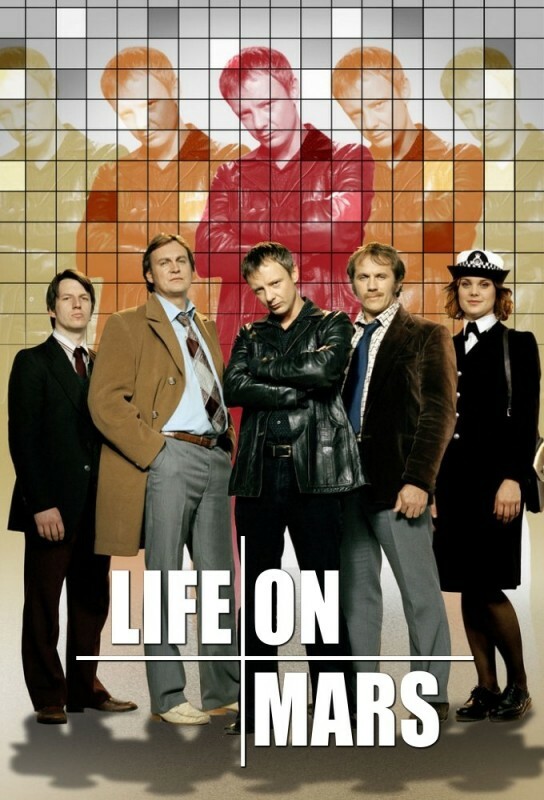 Not to be confused with the American version, which really looks pale besides its British original, Life on Mars is one of my favorite police dramas. I tend to watch a lot of British cop shows and as far as I'm concerned they are so much better than anything we do here in the states. Yes, I like Burn Notice too, but really, trust me on this one. Sam Tyler (John Simm) is a cop or a Detective Chief Inspector (DCI) in Manchester, England in 2006. He gets a disturbing phone call about his girlfriend (she is a cop too) and runs out of the station to save her. But when he gets where he's going and gets out of his car, he's hit by another car speeding by. When Tyler wakes up something is very wrong as nothing looks the same, the neighborhood (he was on a street) his car, his clothing, and the cop who asks him, "Are you OK?" After wandering back to his station, he starts to realize that he is somehow back in 1973. Not only that, but he has come down a notch in rank from DCI to a regular Detective Inspector. His DCI is Gene Hunt (Philip Glenister), a borderline alcoholic who likes to hit first and ask questions later. The show is a police drama but the real fun is watching the reactions of Tyler and Hunt. Tyler has the modern view of policing with his use of computers, forensics, and cultural sensitivity, while Hunt beats the suspects, drinks on the job and is not above planting evidence. He's your classic good bad guy... or bad good guy. You probably have never seen either actor before unless you're familiar with British TV. Simm has done some movies and lots of TV shows, the most well known may be Dr. Who as the Master, and the mini-series State of Play - which was remade as an American movie with Russel Crowe. Again, pale imitation even though Crowe always does a good job. His other credits since Life on Mars includes Mad Dogs, Prey, The Village, The Catch, Doctor Who, Collateral. Glenister has done some minor roles in movies like Kingdom of Heaven and The Other Boleyn Girl and lots of TV movies and shows. Since this show, Glenister has been in Ashes to Ashes, Mad Dogs, Big School, Outcast and many more. I would love to see more of Glenister's work because this guy is fantastic. His role here as the dirty cop who is never the less protective of his subordinates or his city grows on you. You just can't help liking the guy and by the end of the series, you're down right protective of him. He's a character that could have been one dimensional in the hands of the wrong actor, but Glenister is so good, he changes your mind. Other characters include two other detectives, Ray Carling - he is close to Hunt and idolizes him, and Chris Skelton, who is kind of quiet cop as we watch him struggle between Hunt and Tyler, where he wants to fit in with the group but sometimes tries to understand Tyler's weird ways of doing things. And then there's Annie Cartwright (Liz White), the WPC (Woman Police Constable) who is sympathetic to Tyler, but not quite sure if she believes he's a time traveler or not. She also has to endure endless sexism at the station even though she often has good ideas about some of their cases. Since it takes place in the 1970s, there is a nice variety of British music in the background. In fact, the title Life on Mars comes from the David Bowie song that is playing in Sam's car when he gets hit and when he wakes up. There are some anachronistic props in the background that you need to keep an eye out for, because the creators say they did this on purpose. While watching the show, see if you can spot any of them. The show was created by a trio of writers - Matthew Graham, Tony Jordan and Ashley Pharoah, but when it was first pitched, it was shot down by the studio (Kudos film). So another studio ended up making it. One thing led to another and about 8 years and a few rewrites later, BBC Wales gave the series the green light and they made two series/seasons comprising of 16 episodes.